let me add the intuitive interface with useful tools to this point. 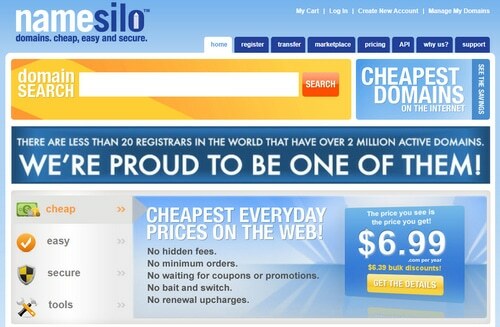 One of the reasons (in addition to pricing) why I have the majority of my domain portfolio there. Only tech thing I’m missing: wildcard subdomain DNS settings. (would be awesome if I could set A records for *.example.com). Hoping for this to be added. The interface is horrid and reminiscent of 2005. I’m giving Namesilo bonus points for NOT having ruined the site (yet?) with a mobile first version for both, desktop and mobile that has about 5% of current functionality left. This is what’s happening on a lot of sites after “making the experience more user friendly”. Not so sure if this is an improvement. For me it’s clearly functionality over design, I switch on most websites to desktop version so I don’t need to deal with missing functions. But on some they are gone from the desktop version as well after the “must make it modern” rampage. Also, please note that we support DNS wildcard records via the “*” character. For example, an A record for *.domain.com pointing at 8.8.8.8 and an A record for http://www.domain.com pointing at 8.8.8.6 would result in all hostnames pointing at 8.8.8.8 except for http://www.domain.com which would point at 8.8.8.6.